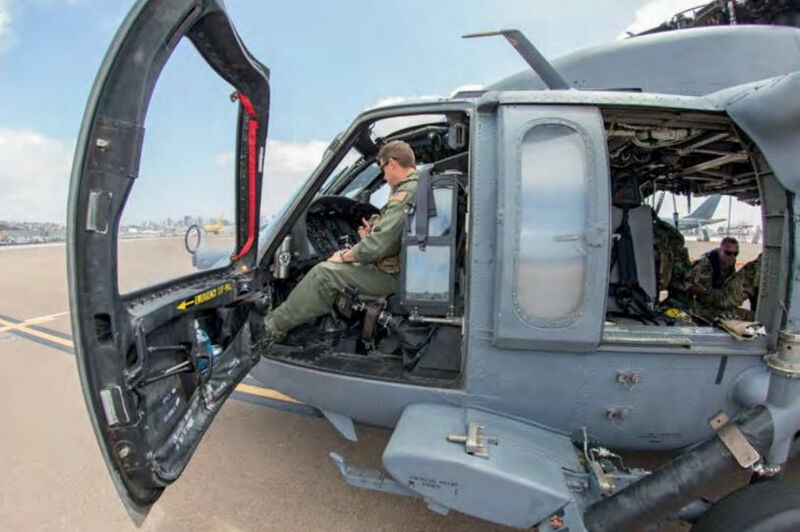 A pilot from the 129th conducts a pre-flight inspection of the Pave Hawk prior to the afternoon launch. The exercise utilised local tourist vessels to simulate a larger cruise ship. 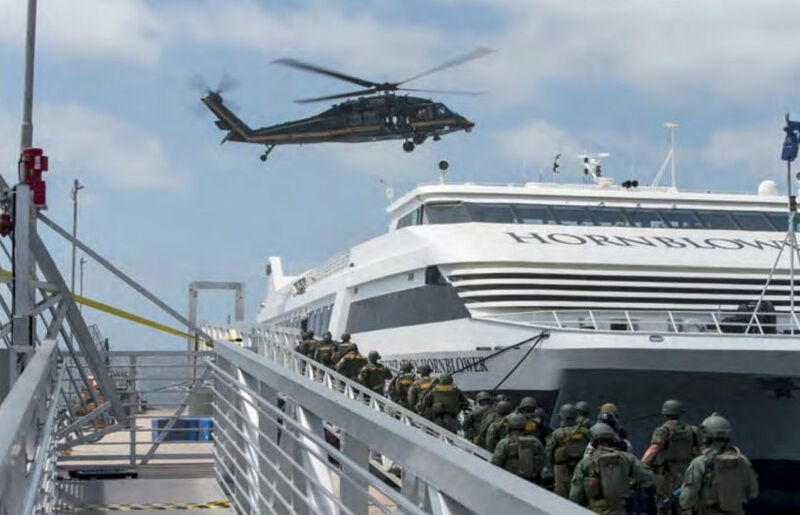 Here a US Customs and Border Patrol HH-60 comes into a low hover over the simulated hijacked ship to set up for a fast rope insertion of a strike team. First responders conducted radiological screenings of both large and small vessels. 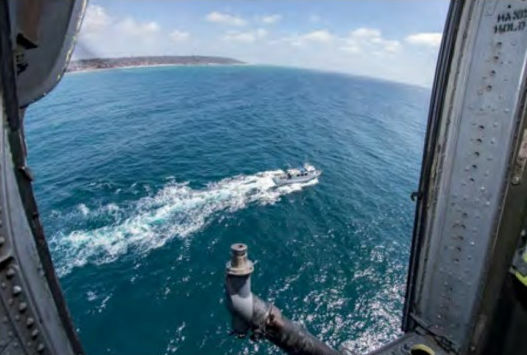 Here the HH-60 conducts a low-level flyover of the local vessel used as the simulated intercept target off the San Diego coastline. 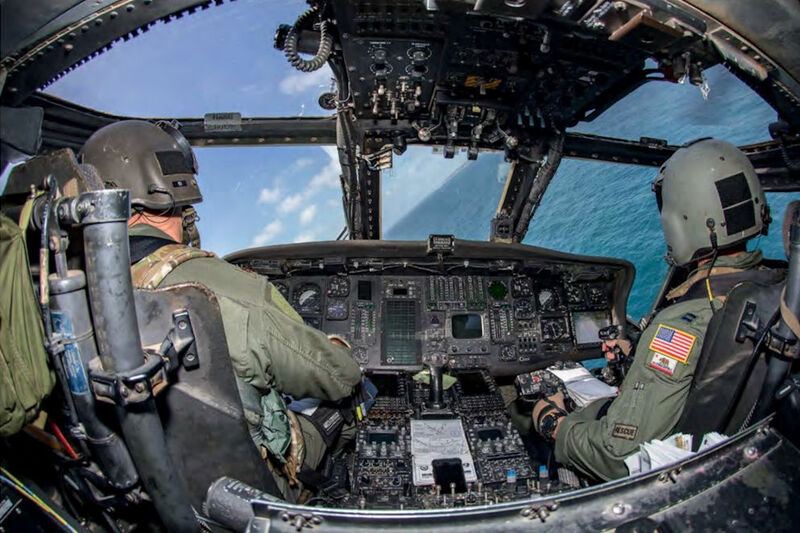 A HH-60G from the 129th Rescue Wing orbits over San Diego Bay during the exercise involving an attempted terrorist takeover of a ship at sea. 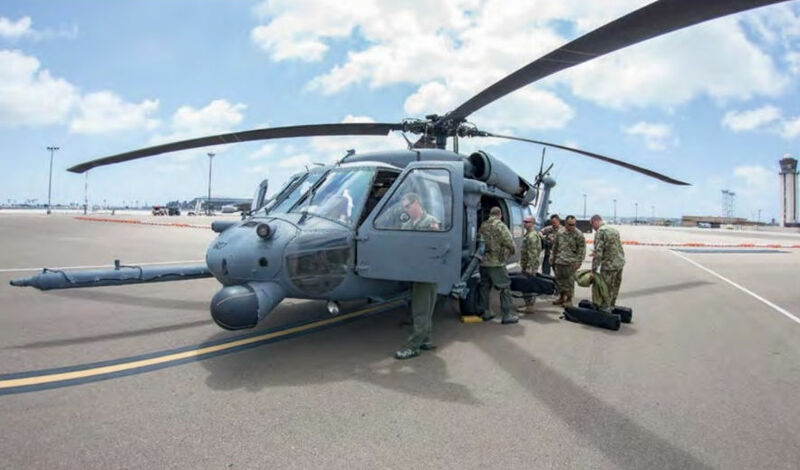 The California ANG HH-60 staged out of nearby San Diego International Airport during the exercise. In this photo the team from the 9th CST prepares to load their specialised equipment onboard the aircraft. The Pave Hawk aggressively turns in pursuit of the suspected terrorist vessel. 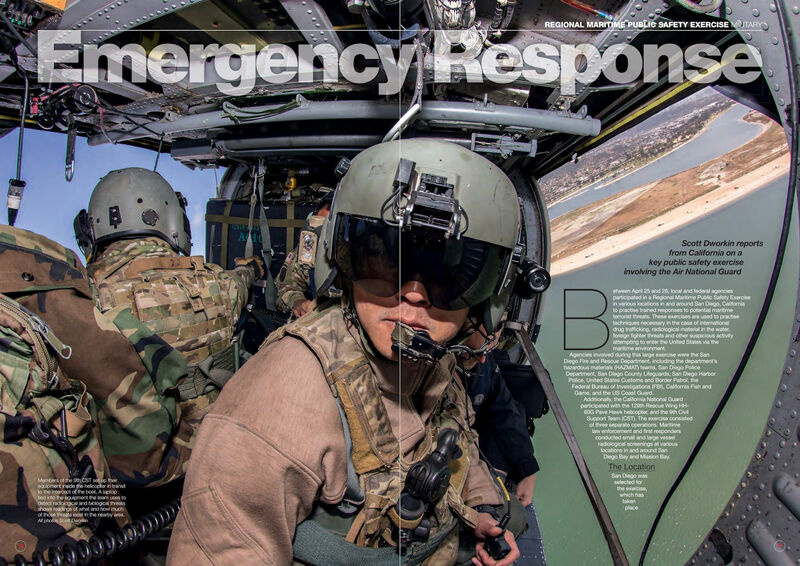 As the 129th is from Northern California, and not entirely familiar with flying in the San Diego area on a regular basis, flying to and from the targets quickly was a major part of the exercise along with identifying and classifying the threats. Members of the 9th CST set up their equipment inside the helicopter in transit to the intercept of the boat. A laptop tied into the equipment the team uses to detect radiological and biological threats shows readings of what and how much of those threats exist in the nearby area. 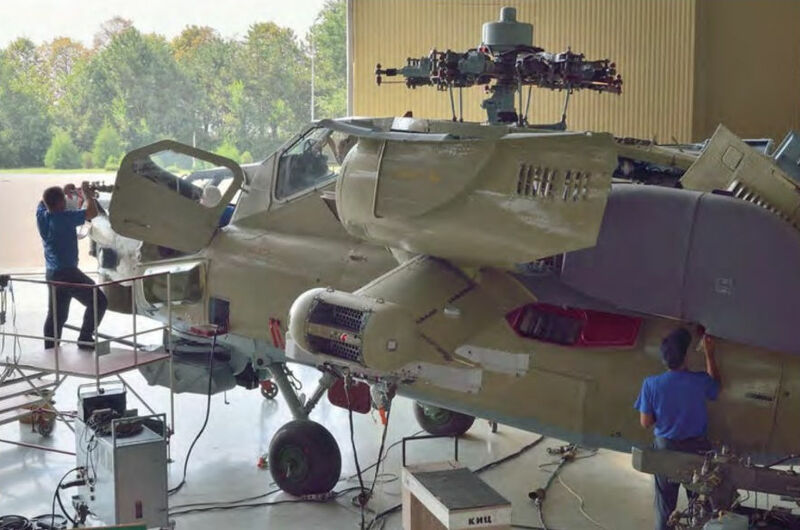 The first Mi-28UB ‘37’ combat trainer converted from Mi-28N c/n 02-01 at the Rosvertol factory. 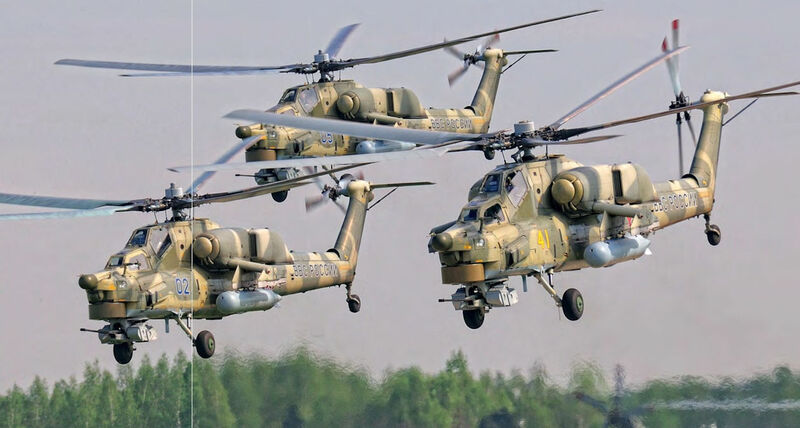 In April 2016 the Russian Ministry of Defence ordered 24 such helicopters to be delivered by 2018. 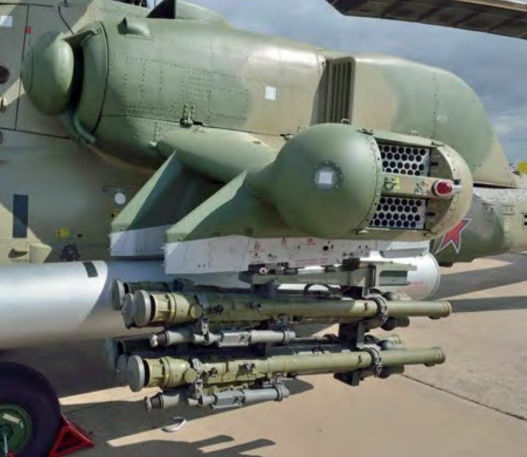 This belly view shows two clusters of Ataka anti-tank guided missiles and two B8V-20A rocket pods under the wing, a single-barrel 30mm 2A42-2 cannon and a round OPS-28 electro-optical turret in the nose. A box with two round antennas at the root of the tail beam contains DISS-32-28 Doppler radar. 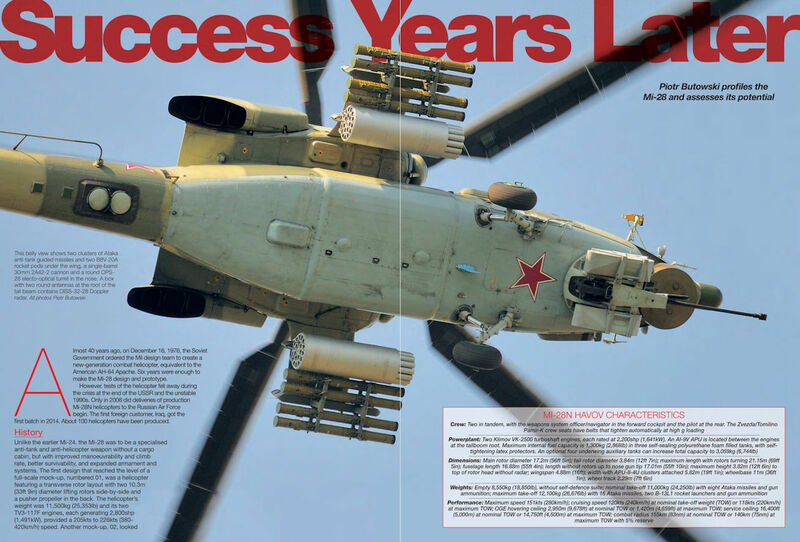 This helicopter, ‘03’, was one of the first operational Mi-28Ns. Note the NPPU-280-1 nose turret with flexible single-barrel 30mm 2A42-2 cannon and 250 rounds in side magazines. 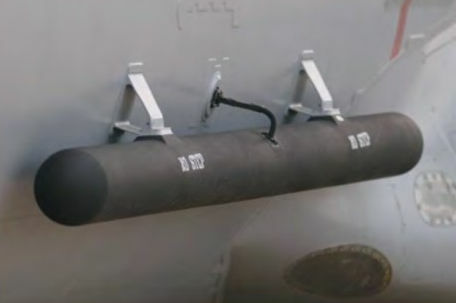 The I-256 radio-command guidance datalink for the Ataka missile is fitted in the nose tip. 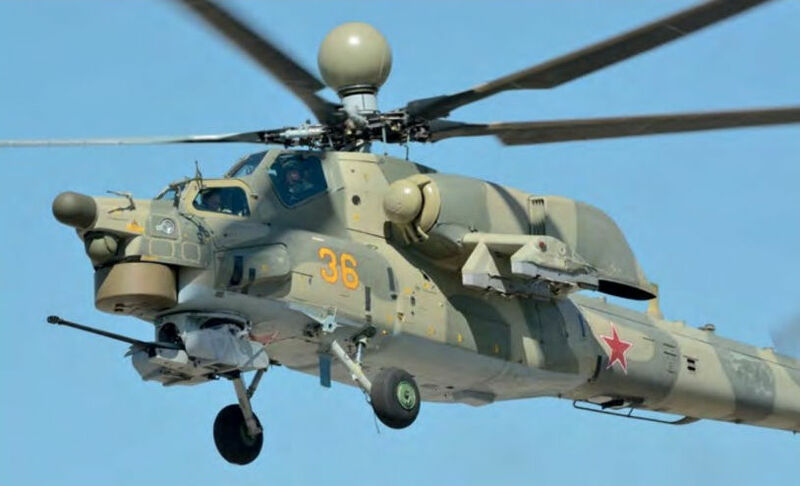 By 2020 Mi-28N will be the most widespread combat helicopter in service with the Russian armed forces. 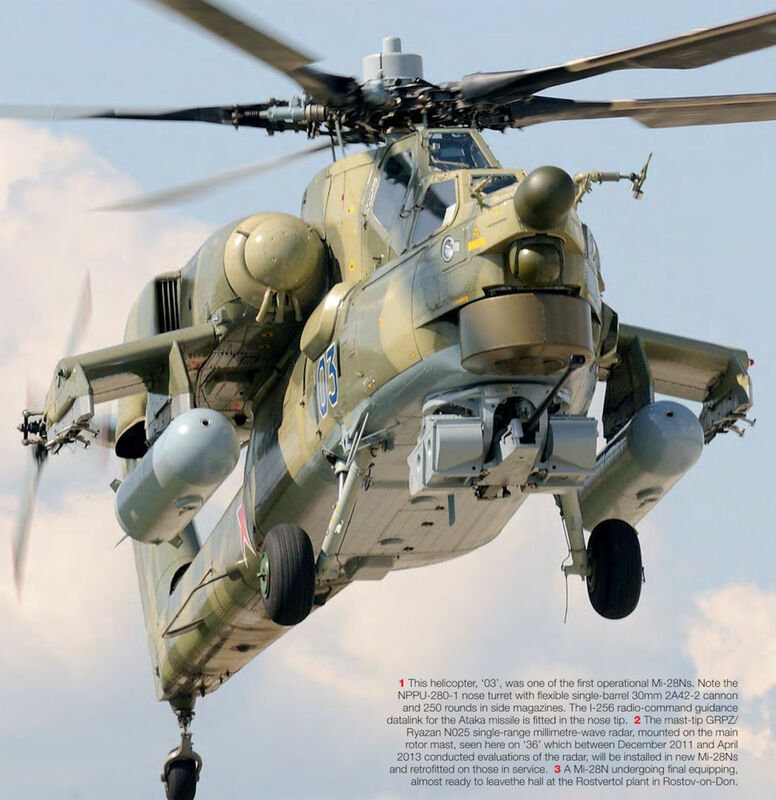 The mast-tip GRPZ/Ryazan N025 single-range millimetre-wave radar, mounted on the main rotor mast, seen here on ‘36’ which between December 2011 and April 2013 conducted evaluations of the radar, will be installed in new Mi-28Ns and retrofitted on those in service. 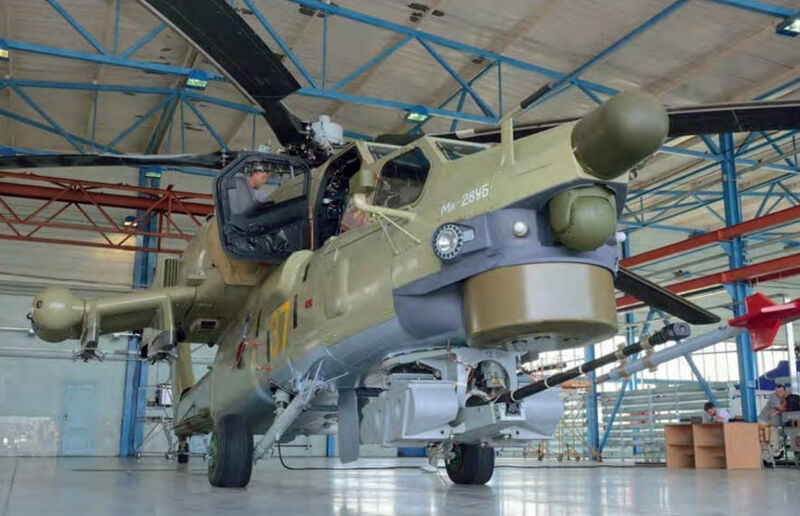 A Mi-28N undergoing final equipping, almost ready to leave the hall at the Rosvertol plant in Rostov-on-Don. 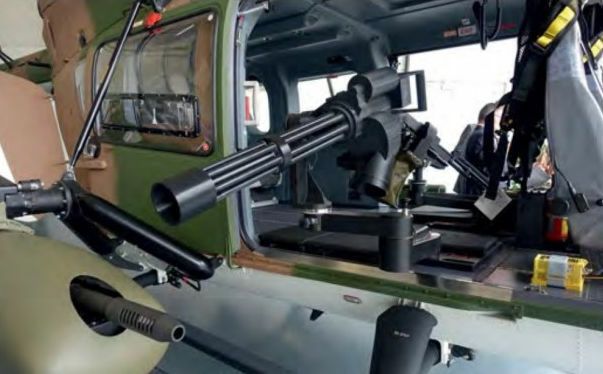 Optionally, the helicopter takes four 9M39 Igla-V anti-aircraft tube-launched missiles to counter enemy helicopters. 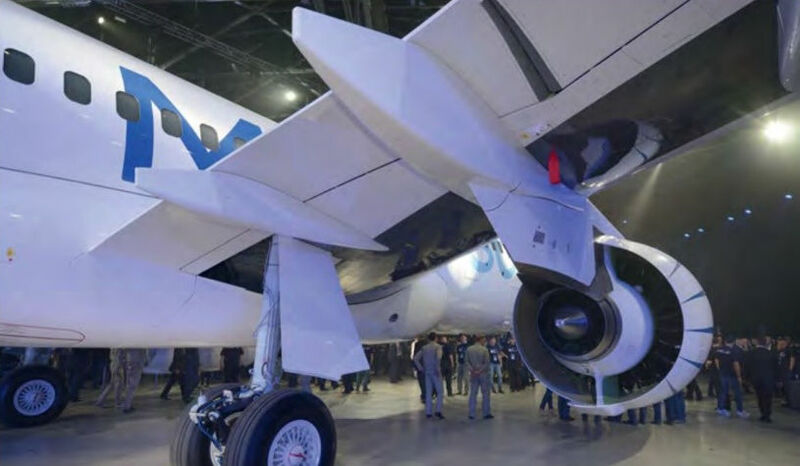 Note also the engine nacelle in the background, with an inlet dust filter and a fixed heat dissipater at the engine exhaust. 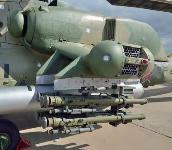 A cluster of eight 9M120 Ataka-VN anti-tank guided missiles on an outer underwing pylon is a standard weapon. 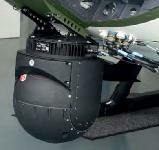 The OPS-28 Tor electro-optical turret is the Mi-28N's main search and targeting sensor. A ball for the pilot’s TOES-521 turret is fitted above. Two blisters at the sides are sensors for the L150-28 radar warning receiver. 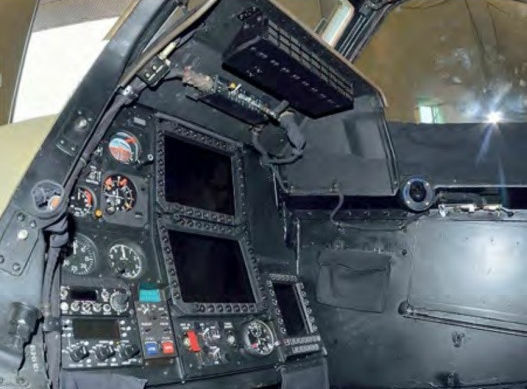 The Mi-28N operator’s (front) cockpit has two MFI-10-6M displays arranged vertically, a PS-7V control panel on the right and a basic set of analogue instruments on the left. Boeing 777-200ER JA744A (c/n 40903), photographed at Sapporo, is one of 28 Triple Sevens in the ANA fleet, that according to the aircraft's latest schedules are used on intra-Asia routes. Kanto 21 on the ramp at Yokota Air Base, Japan. 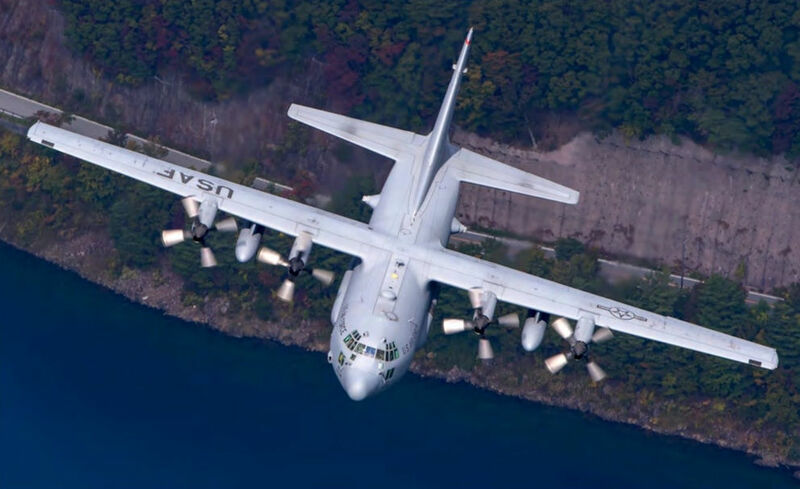 The C-130H carries 6,700 US gallons (25,362 litres) of fuel in six integral wing tanks; the external tanks under the wing each have a capacity of 1,300 US gallons (4,921 litres). Kanto 22 flying over mainland Japan. Restrictions on low flying mean the squadron regularly deploys to Thailand and Singapore for training. The area of responsibility for the 36th AS is huge, covering 50% of the world's surface, and stretching from Afghanistan to Guam in the Pacific Ocean. 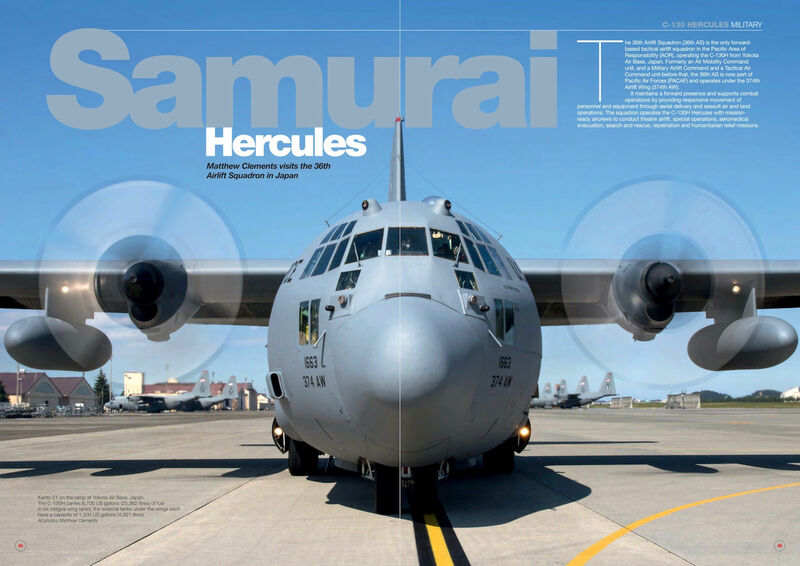 The first of 14 C-130Js will arrive at Yokota in October 2016 as the process to begin replacing the Hs begins. 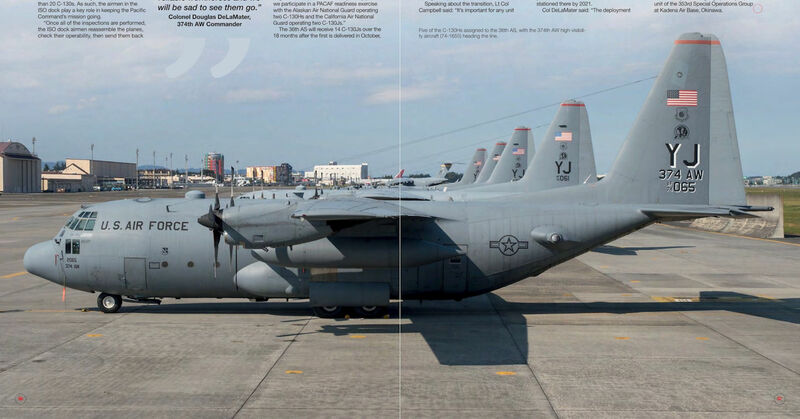 Five of the C-130Hs assigned to the 36th AS, with the 374th AW high-visibility aircraft (74-1655) heading the line. 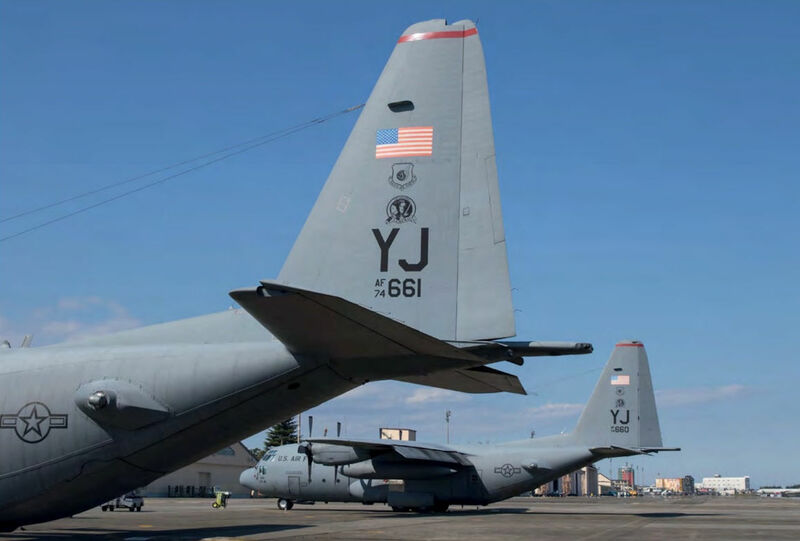 C-130H 74-1669 assigned to the 36th AS undergoing its extensive two-week inspection by the 374th Maintenance Squadron isochronal inspection team at Yokota, in the ISO dock. 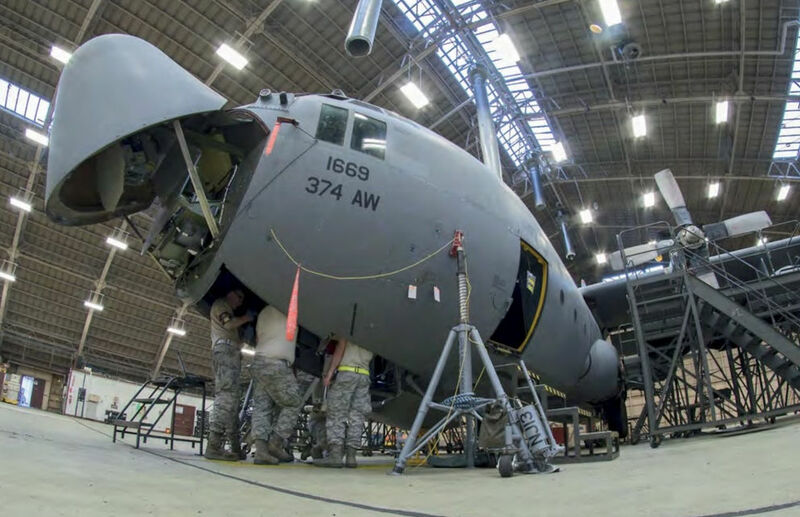 The ISO dock inspection on an older C-130H requires 9.7 maintenance hours per flying hour, a figure which will drastically reduce as C-130Js are put into service. 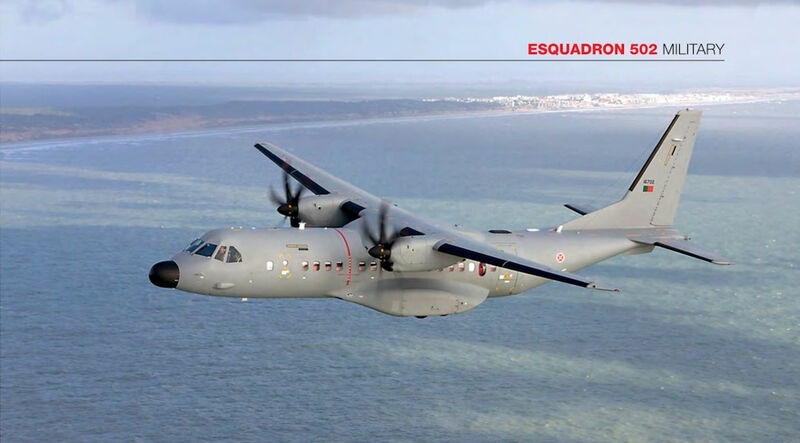 Esquadron 502 shares it's flight line at BA6 Montijo with the C-130H Hercules-equipped Esquadron 501. 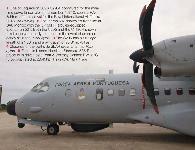 Both the C295 and the C-130H shown in this image were ready to launch in the event of an emergency situation. Lt Col John Kerr (pilot/aircraft commander), Capt Max Mallory (co-pilot), Lt Mike Dzyndra (navigator) and SSgt John Denman (flight engineer) in the cockpit of Kanto 21 as it manoeuvres near the Izu Peninsula on the Pacific coast of Honshu, Japan. 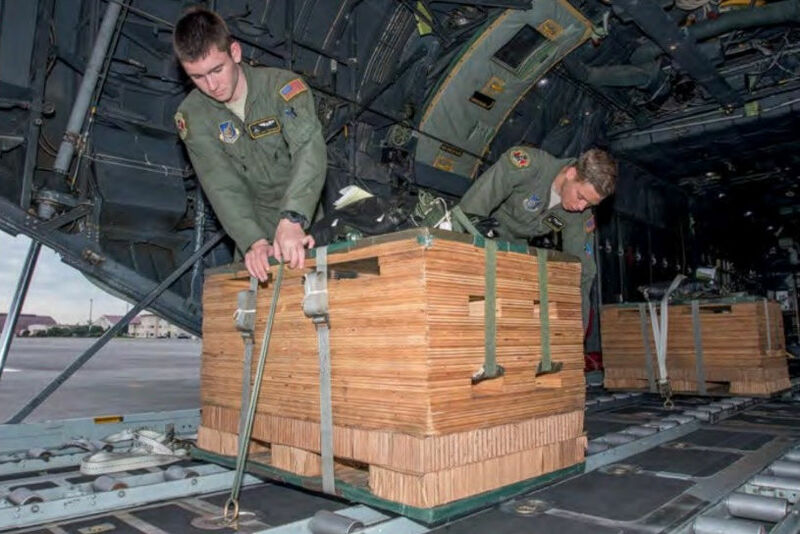 Loadmasters SSgt Joel Brenner (left) and SrA Nathanial Bennett (right) securing an airdrop bundle on Kanto 21. 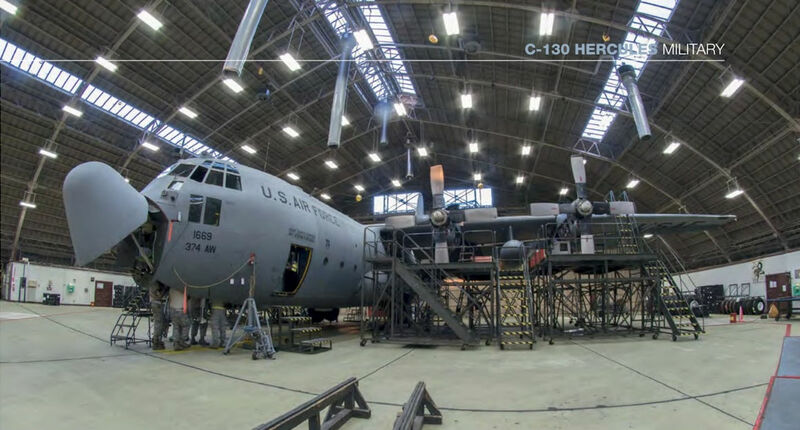 The C-130H has a maximum load of either six pallets, 74 litters, 16 container delivery system bundles, 92 combat troops or 64 paratroopers - or a combination of any of these. More than 180 PC-21s have been ordered by air forces jn Singapore, Switzerland, the UAE, Saudi Arabia, Qatar and Australia. 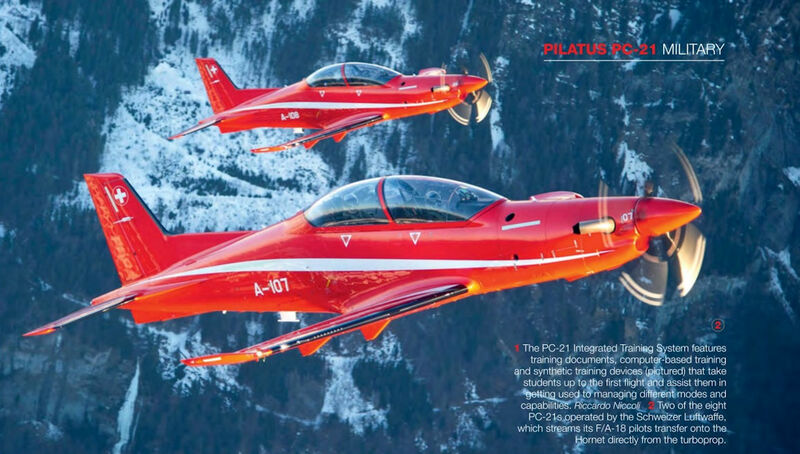 Pilatus claims the PC-21's flying cost per hour is about 40 times cheaper than that of a modern fighter, helping air forces download training from more expensive lead-in fighter trainers. 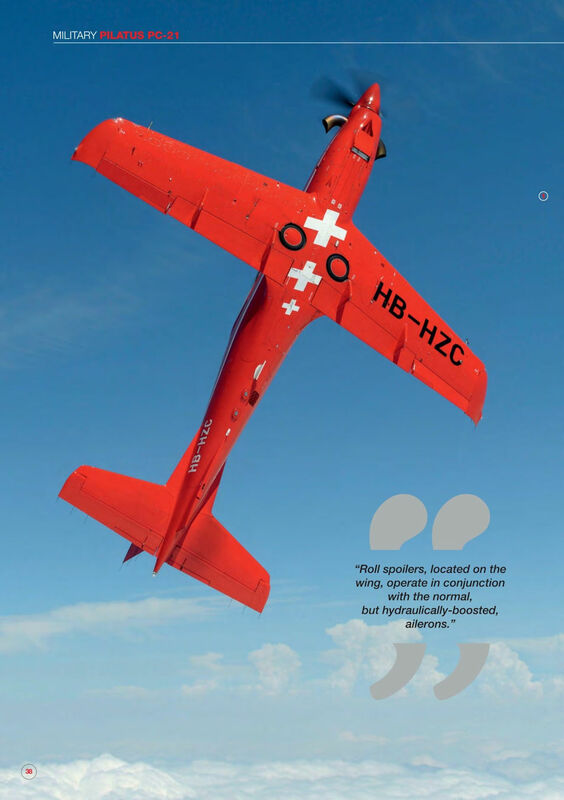 The PC-21 wing, 13° swept and with winglets, has a laminar airfoil, a span of 9.10m, an area of 14.9m2 and an aspect ratio of 5.1. 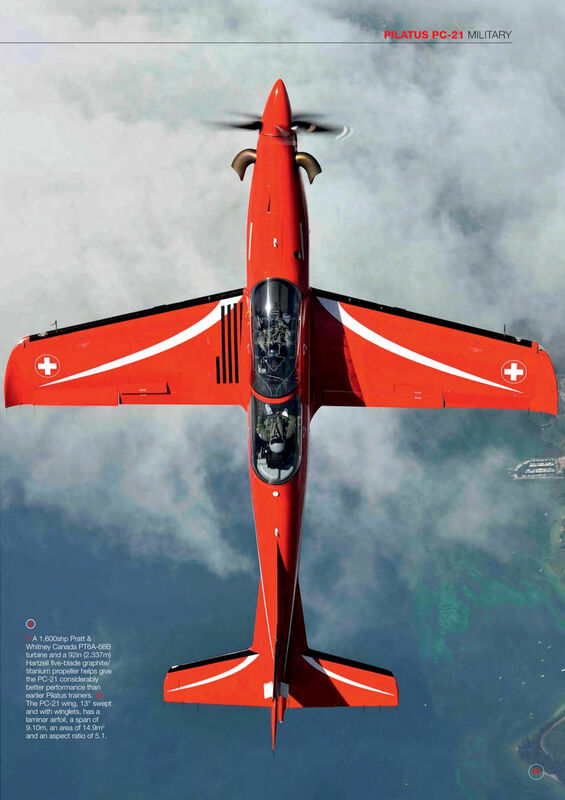 Sleek looks, even on the ground, reflect Pilatus' aim with the PC-21 of creating a trainer that combines the advantages of a light turboprop trainer with the handling and performance of a jet trainer. Two of the eight PC-21s, operated by the Schweizer Luftwaffe, which streams its F/A-18 pilots transfer onto the Hornet directly from the turboprop. 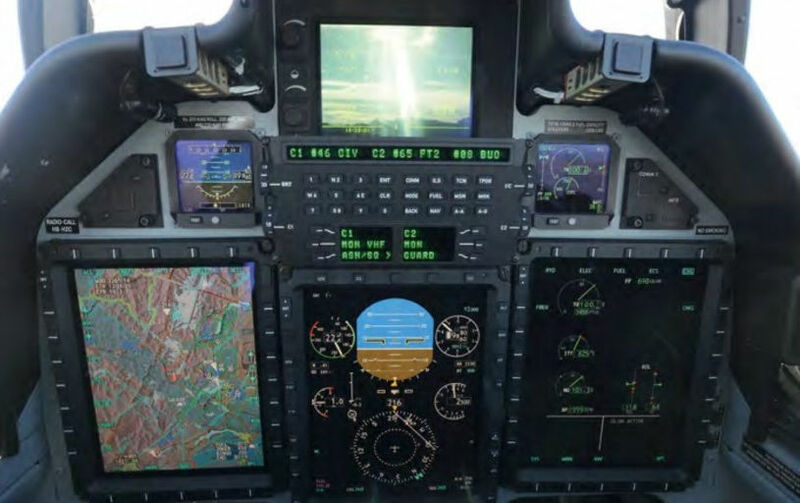 Both cockpits have three NVG-compatible multifunction displays; the front cockpit has a head-up display (HUD) and the aft cockpit a HUD repeater. 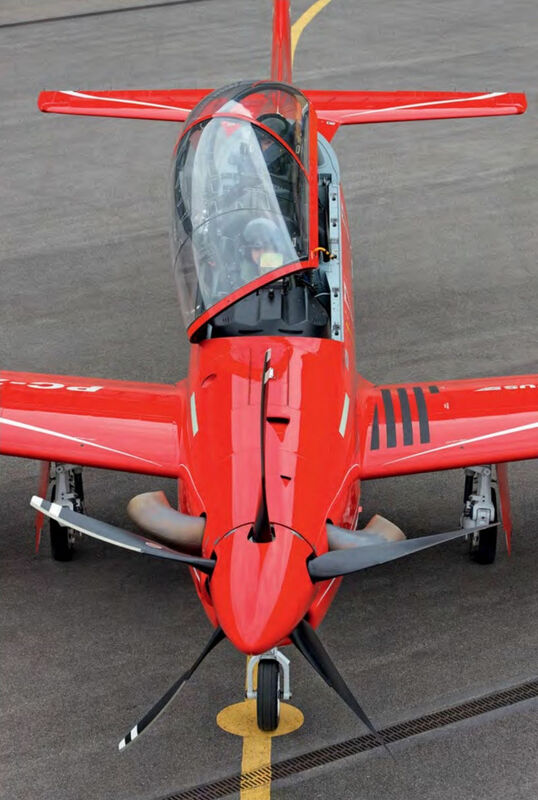 The stepped cockpit, with a front canopy that can resist birdstrikes at high cruise speeds, creates good all-round visibility for both student and instructor. 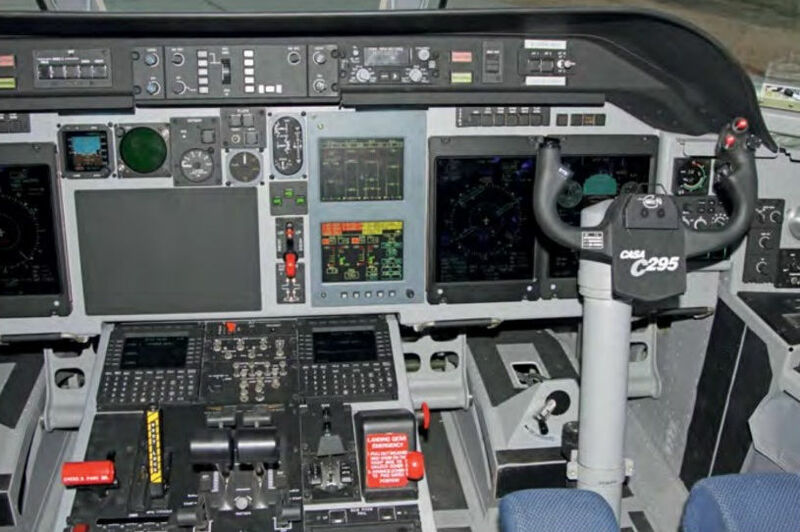 The pressurised cockpit is equipped with an anti-g system and two Martin-Baker Mk-CH16C zero/zero ejection seats. 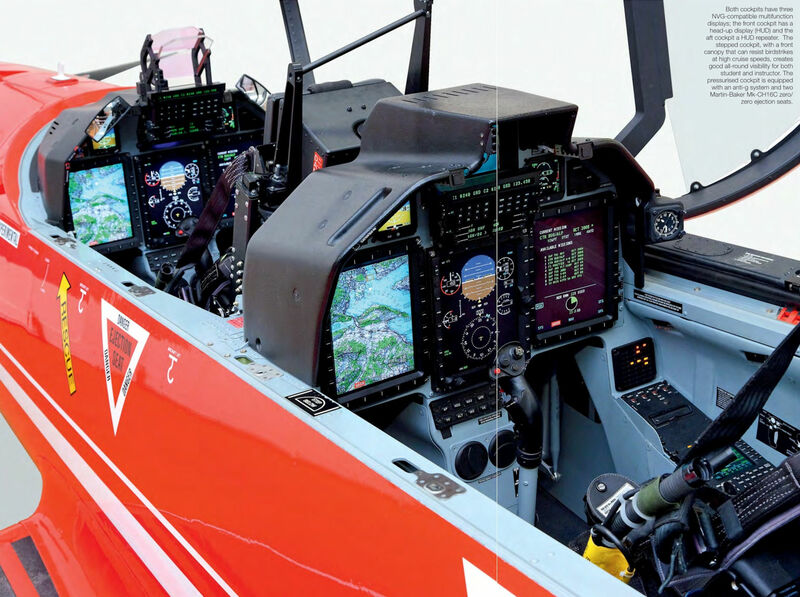 The primary flight display is selected in the middle multifunction display. 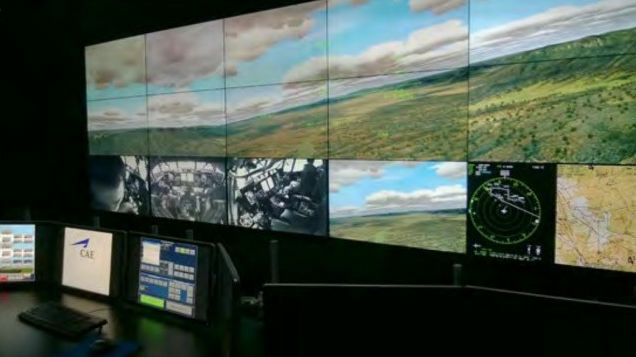 The moving map, navigation and tactical display or synthetic radar display are on the left. On the right is the engine and fuel data display, which can also display simulated weapons. 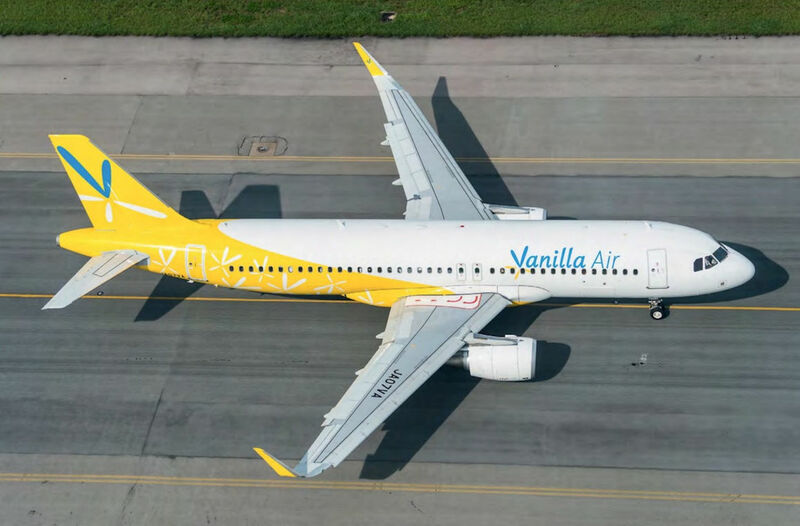 ANA subsidiary Vanilla Air uses eight aircraft, including A320-214 JA07VA (msn 6422), on routes between Hong Kong, Taiwan and Japan. 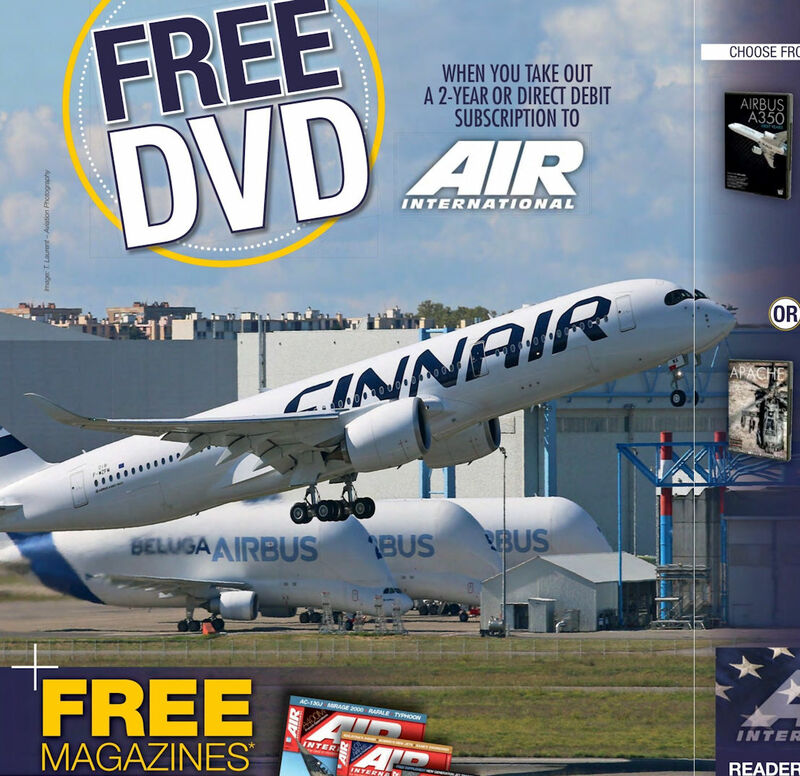 ANA was the launch operator of the 787, and by late April had 46 examples (35 787-8s and 11 787-9s) in service. Here JA837A is pictured at Paris Charles de Gaulle. 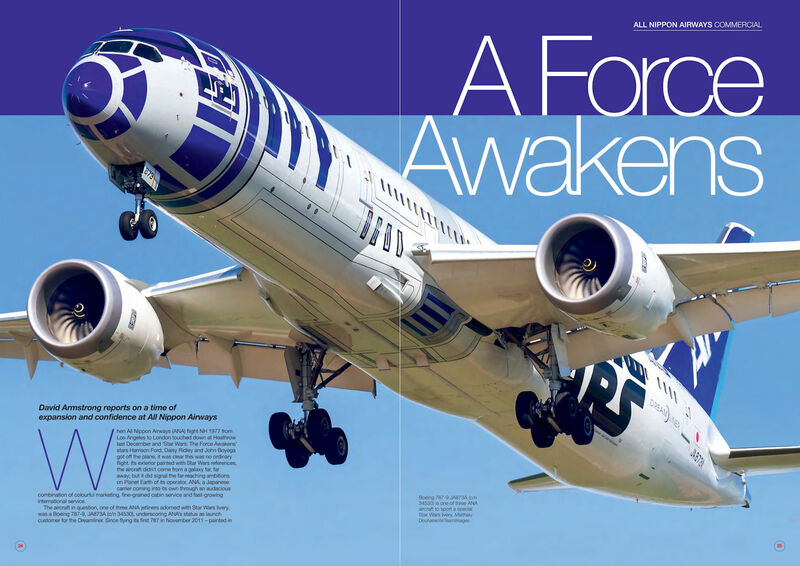 Boeing 787-9 JA873A (c/n 34530) is one of three ANA aircraft to sport a special Star Wars livery. 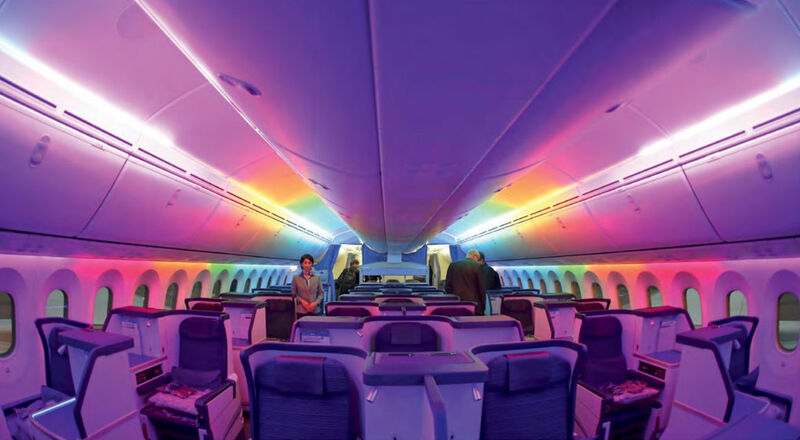 Business class, seen here with the Dreamliner's mood lighting, is equipped with 44 seats. 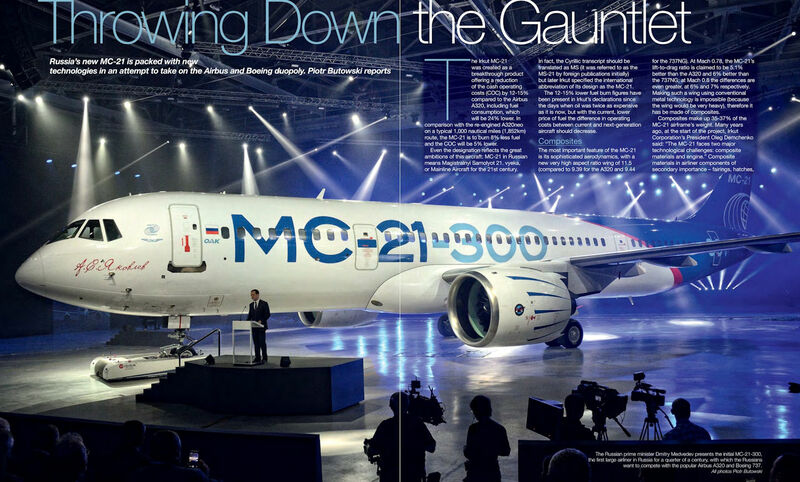 The Russian prime minister Dmitry Medvedev presents the initial MC-21-300, the first large airliner in Russia for a quarter of a century, with which the Russians want to compete with the popular Airbus A320 and Boeing 737. 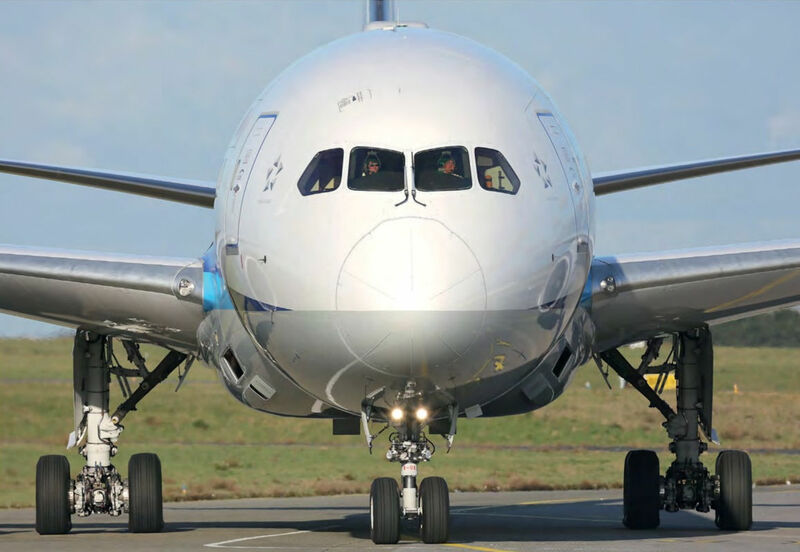 The MC-21 main undercarriage leg has two wheels as standard; however, it is possible to order four-wheel boogies to enable operation from poor-quality runways. 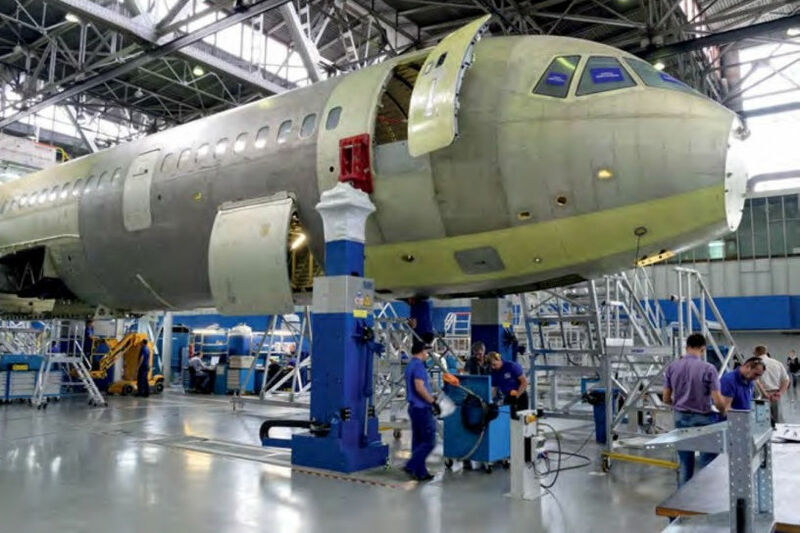 The Irkutsk plant finishes fuselage assembly of the second MC-21-300SI (Staticheskiye Ispytaniya), intended for static tests which will begin this autumn with the TsAGI in Zhukovsky. 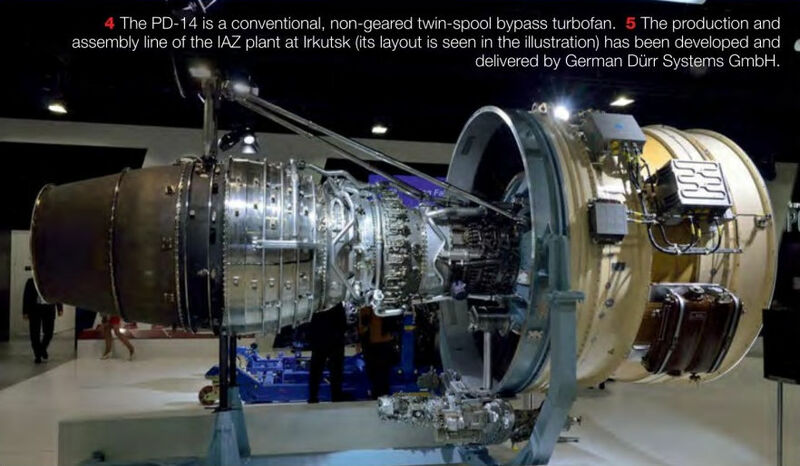 The production and assembly line of the IAZ plant at Irkutsk (its layout seen in the illustration) has been developed and delivered by German Durr Systems GmBH. 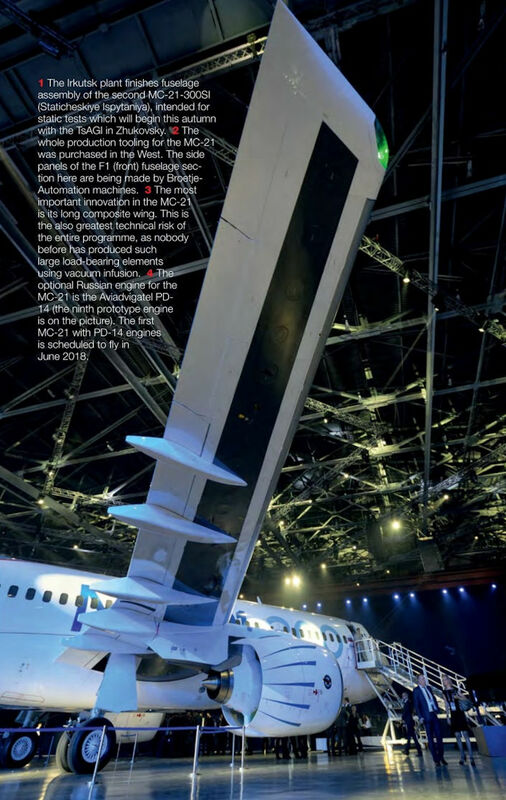 The whole production tooling for the MC-21 was purchased in the West. The side panels of the F1 (front) fuselage section here are being made by Broetje-Automation machines. 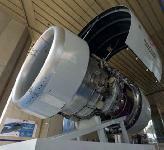 The optional Russian engine for the MC-21 is the Aviadvigatel PD-14 (the ninth prototype engine is on the picture). 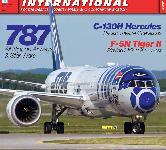 The first MC-21 with PD-14 engines is scheduled to fly in June 2018. The PD-14 is a conventional, non-geared twin-spool bypass turbofan. 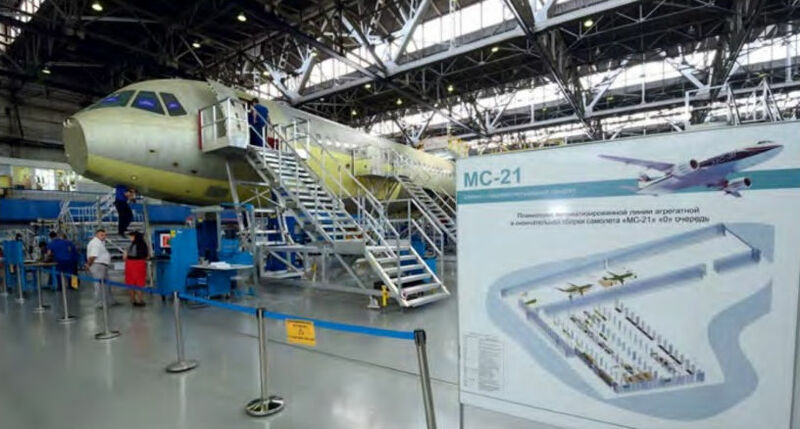 The MC-21 avionics (the cockpit mock-up is pictured here) has been integrated by the UAC Integration Centre with participation of other Russian companies; foreign participants deliver only separate components. 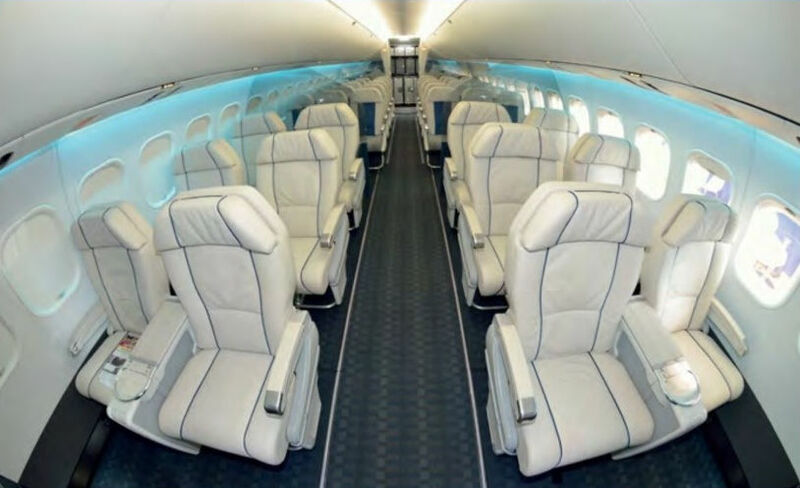 A mock-up of the future passenger cabin of the MC-21. 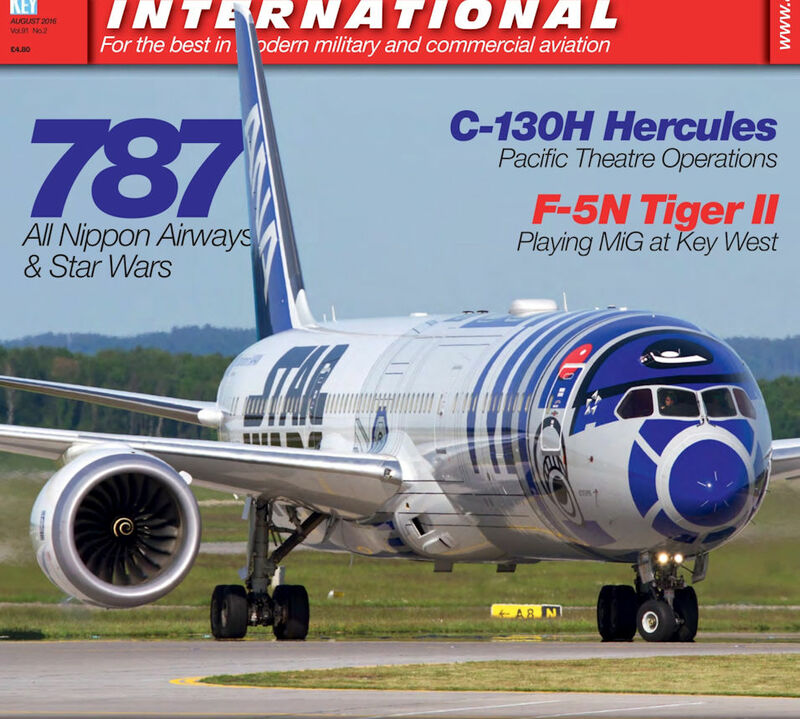 In typical configuration, the MC-21-300 will take 163 (16 business and 147 economy class), and a maximum 211 passengers. The C295 has a fuselage length of 24.50m and a wingspan of 25.81 m.
One of Esquadron 502's C295s configured for the maritime surveillance role, serial number 16710, seen at RAF Fairford after its arrival for the Royal International Air Tattoo 2013. 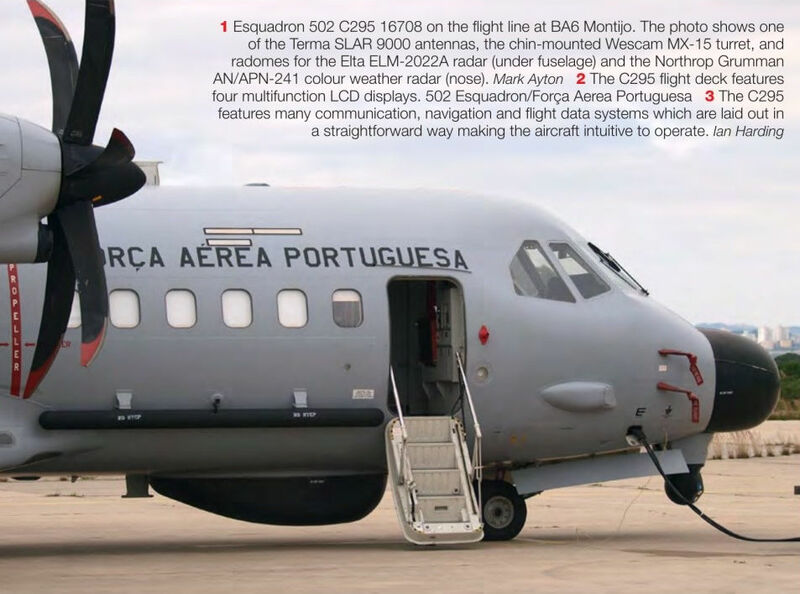 Esquadron 502 C295 16708 on the flight line at BA6 Montijo. The photo shows one of the Terma SLAR 9000 antennas, the chin-mounted Wescam MX-15 turret, and radomes for the Elta ELM-2022A radar (under fuselage) and the Northrop Grumman AN/APN-241 colour weather radar (nose). Each six-bladed Hamilton Standard 586-F propeller is driven by a Pratt & Whitney Canada PW127G turboprop rated at 2,645hp (1,972kW). Close-up of the port side SLAR radar antenna. 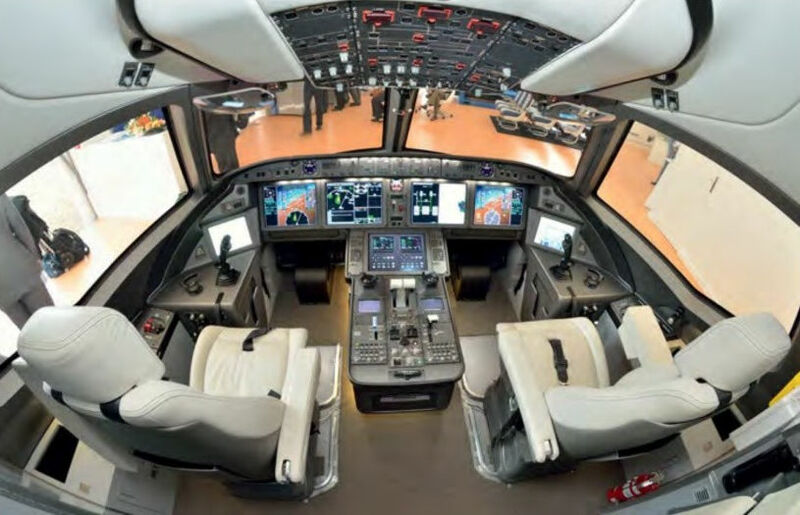 The C295 flight deck features four multifunction LCD displays. 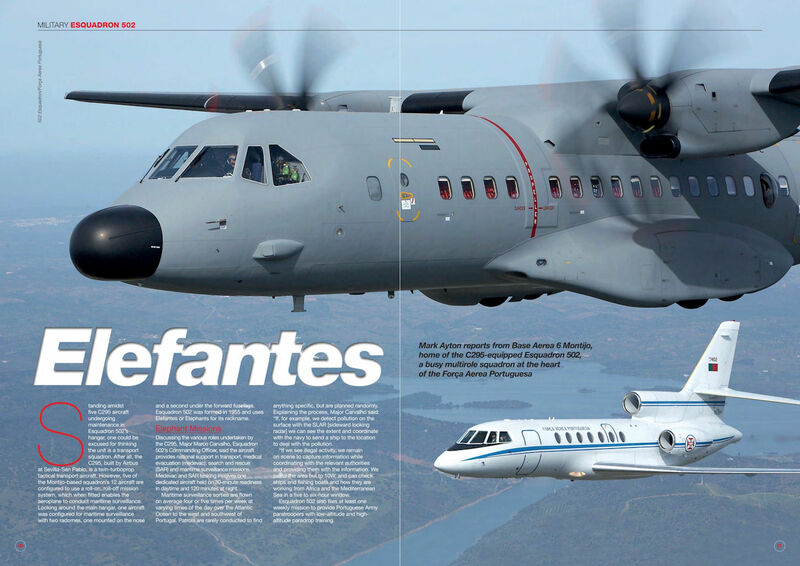 The C295 features many communication, navigation and flight data systems which are laid out in a straightforward way making the aircraft intuitive to operate. 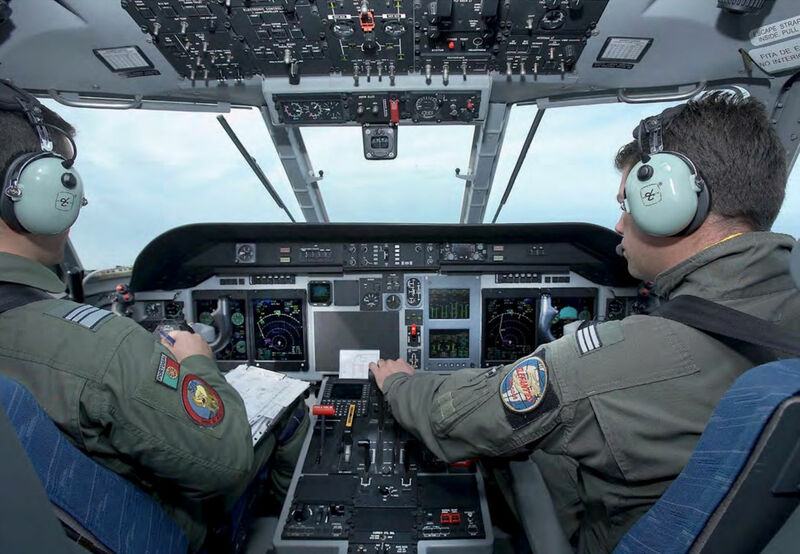 The UK MoD’s requirement is to train 121 pilots and 80 crewmen per year; the ground training aids will be a key element of their training alongside the aircraft. 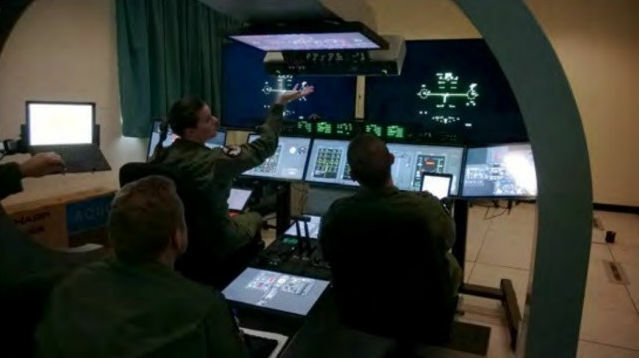 CAE of Canada will supply static simulators and other training aids, while Lockheed Martin Training and Simulation in the US will provide the training courseware. The UK MoD has ordered 29 H135Ms to replace AS350BB Squirrels that have been in service since the 1990s. The first helicopter is due for delivery to RAF Shawbury later this year, with the initial course of students starting training in April 2018. 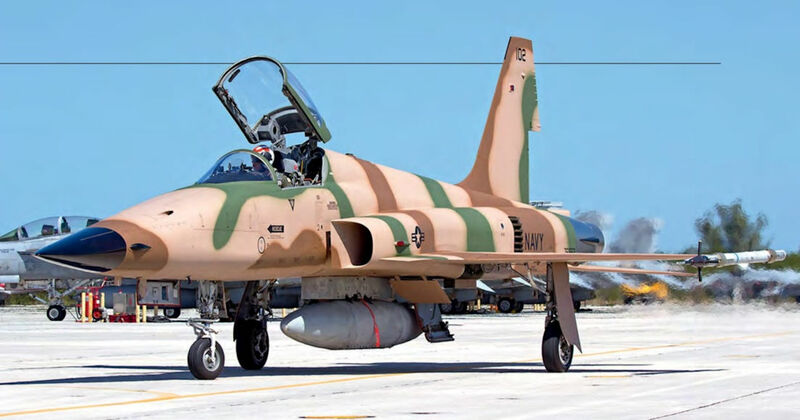 The high demand for adversary training combined with a low operating cost base means VFC-111 is likely to continue operating the F-5N until 2020. Sundowner 104 and 115 head out to the range. 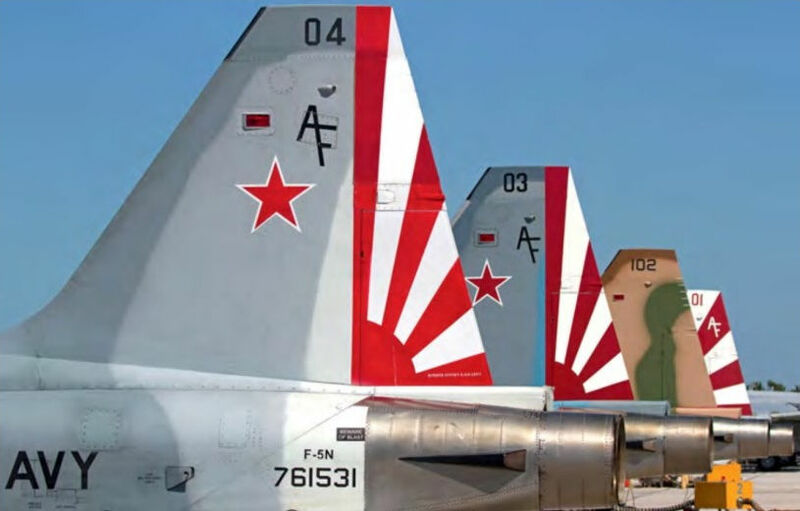 VFC-111 's aircraft are painted in different colour schemes; just one aspect of the squadron’s adversary mission. 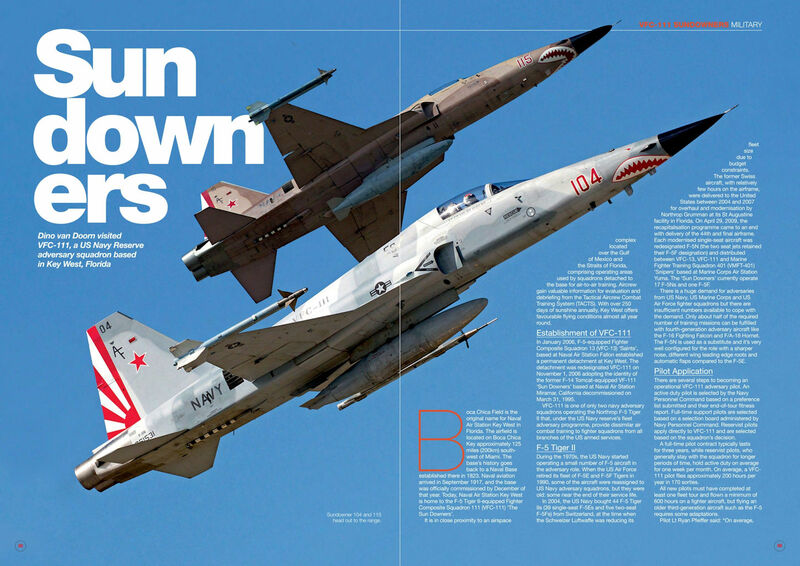 Each col­our scheme is designed to replicate different types of potential enemy fighter aircraft. 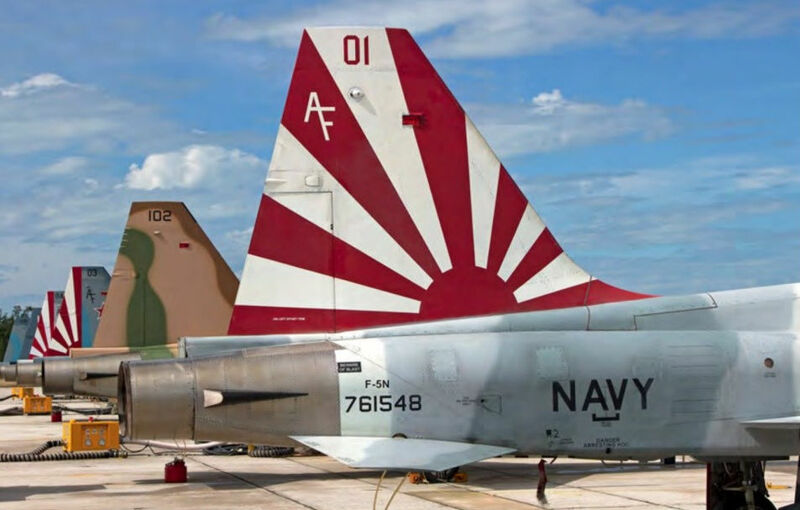 VFC-111 's Sun Downers nickname originates from Fighter Squadron 11 (VF-11) and refers to the unit's mission to shoot down Japanese fighters or suns during World War Two. 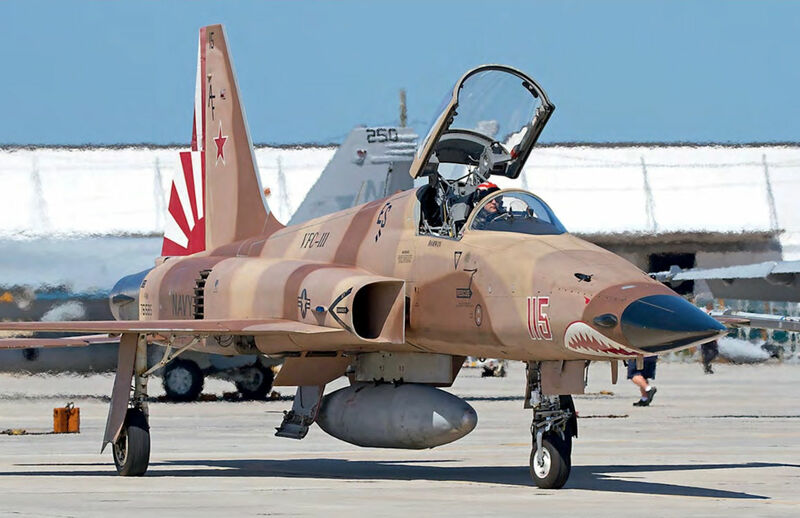 An F-5N returns to the VFC-111 ramp after a mission against F/A-18 Super Hornets from Strike Fighter Squadron 122 (VFA-122) 'Eagles’ based at Naval Air Station Lemoore in California. 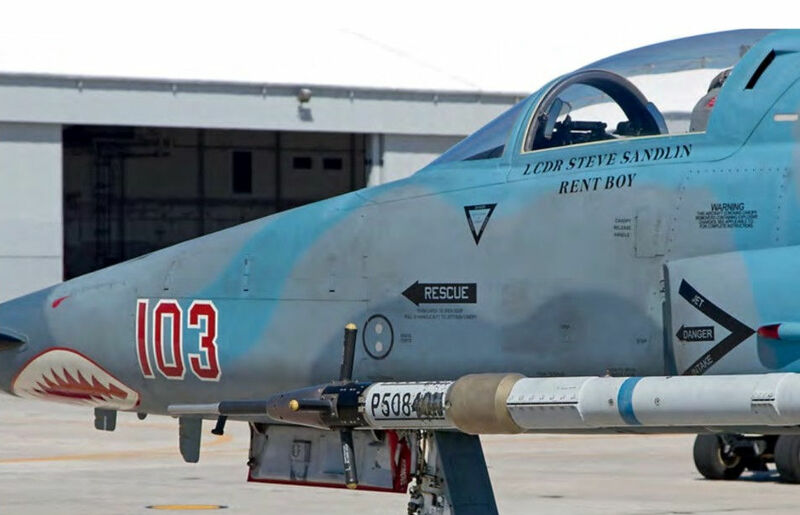 F-5N BuNo 761562 seen at Key West without VFC-111 markings. The aircraft had recently returned from its annual phase inspection undertaken by Northrop Grumman at its St Augustine facility in Florida. 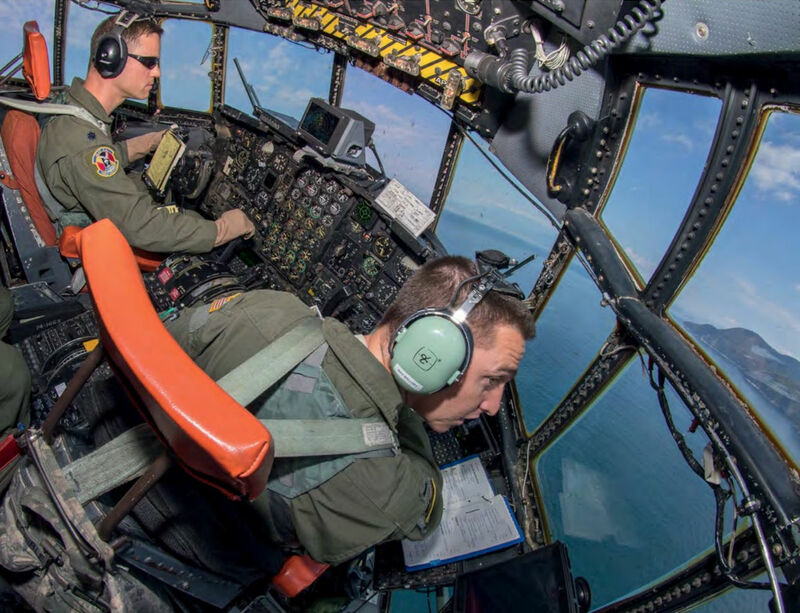 Maintenance at Key West is performed by Sikorsky Aircraft Corporation. 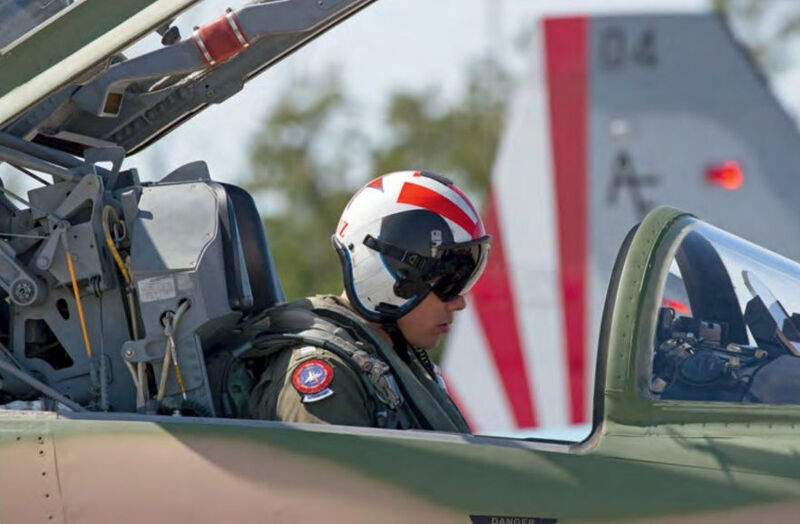 With over 250 days of sunshine each year, Naval Air Station Key West offers favourable flying conditions almost year round. P5 air combat manoeuvring pods are mounted on a wingtip rail to capture positional and flight data during all aerial duels flown in the Key West range. Five of the 15 H145Ms that will be operated by the Luftwaffe on behalf of the Kommando Spezialkrafte Bundeswehr (KSK) in the special forces role have now been delivered. The five H145Ms ordered by the Royal Thai Navy in September 2014 are due to be delivered by the end of this year. 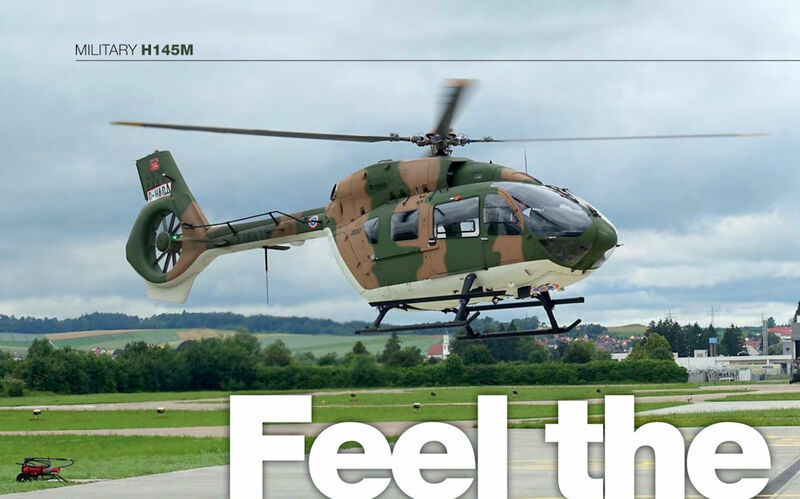 The first two were handed over at Airbus Helicopters' facility in Donauworth in the spring, and remain in Germany for pilot training. 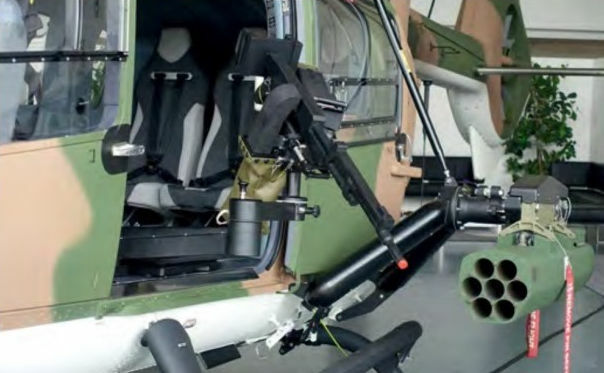 A Dillon M134D Gatling Gun is among the standard weapons on the H145M. 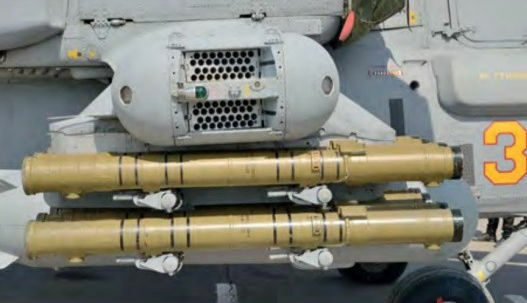 Weapons currently cleared for carriage on the removable pylons attached to either side of the cabin include the 12.7mm FN Herstal HMP400 gun pod and/or Forges Zeebrugge FZ233 7-shot lightweight rocket pod. 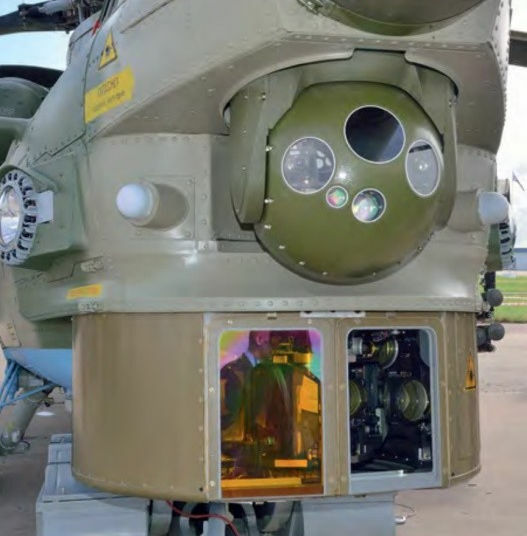 A laser designator will be integrated into the nose- mounted Wescam MX-15HD electro-optical system, enabling a range of future laser-guided weapons to be used. 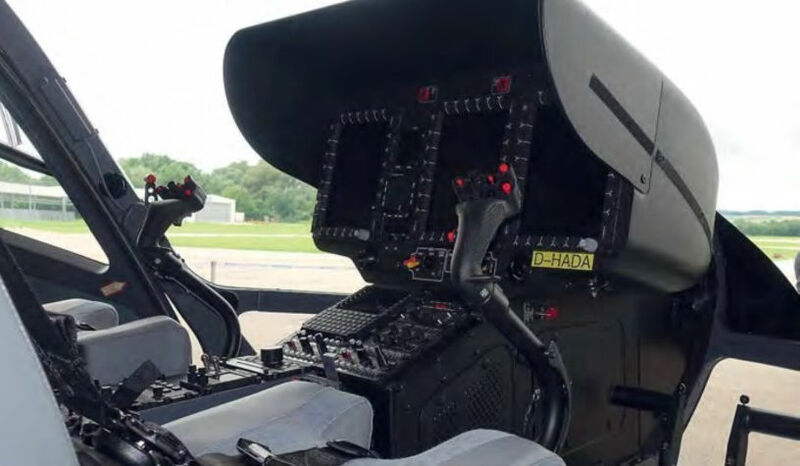 The cockpit is fitted with fully integrated Garmin GTN750 GPS/NAV/COM/MFD units and Airbus Helicopters' latest Helionix digital avionics suite. 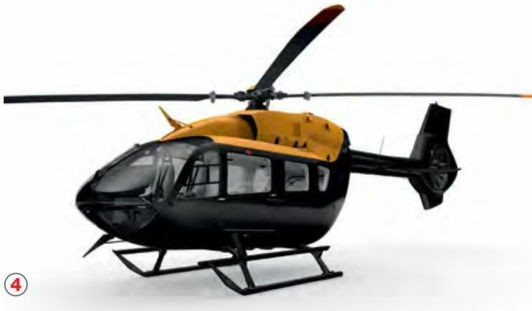 Three H145Ms are being acquired to replace Bell 212s. The H145Ms will be used for maritime training at RAF Valley.